The Magnetometer is designed around the Honeywell magneto-resistive senor HMC1222. The unit is supplied with a programmed PIC which controls the operation of the unit and handles the I2C protocol to the external bus The board should be mounted with the face normal to the local field. 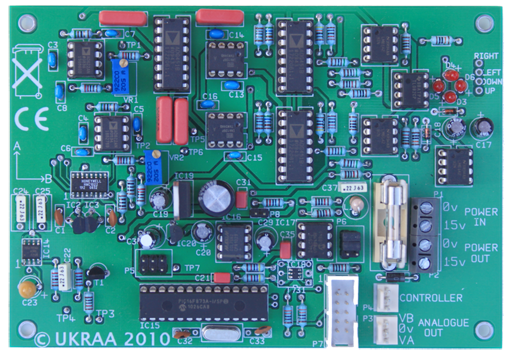 The Magnetometer requires a 15v DC supply which can also be connected through via a spare set of screw terminals to power a UKRAA controller if used. The outputs are are via two 3 pin polarised header plugs on the board and suitable shells and inserts are supplied. The pcb is fully populated with socketed DIL ICs and is aligned and tested before dispatch.